‘On Monday we came here, making a detour to visit the ruins of Quin Abbey. It stands in a green plain near the clear river. The cloisters resemble those of Askeaton, and are in as good preservation; indeed the whole building, except the roof, is entire. Most of the chimney-pieces remain; and a peasant woman, who came up to speak to me as I was examining an old monument, said that her grandmother remembered when it was all perfect. I looked on these cloisters with great interest, as the place where the monk who composed those beautiful lines to Lady O’Brien, was wont to meditate and pray. While we were in the abbey, the funeral procession of a young girl entered the ruined building, and, as is always the case in Ireland, several groups dispersed themselves in various directions, each to weep over the grave of their own friends. I remarked one girl particularly, who knelt at a tomb which, from its grass-grown appearance, seemed to have been there a long time; she must have been quite young when she lost the friend or relative who reposed in it; but the expression of solemn concern on her countenance showed how deeply she still revered the memory of that departed one. 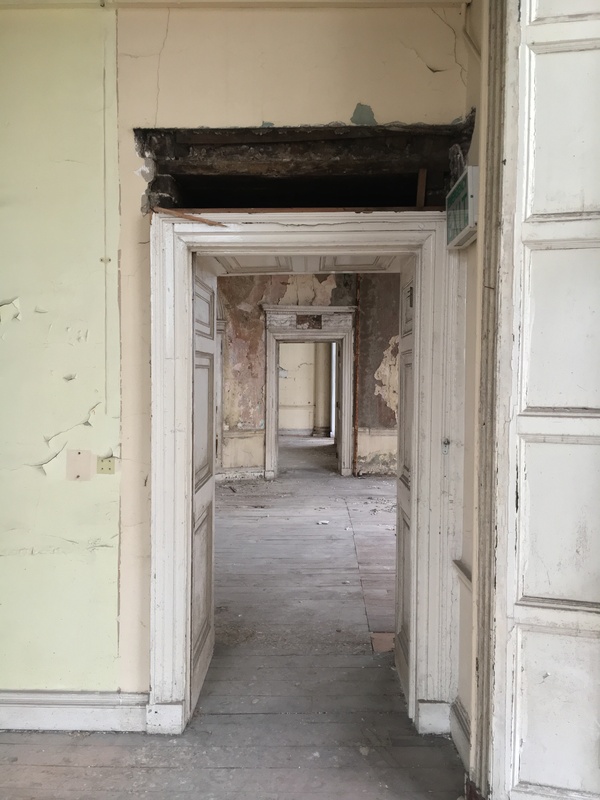 This week it was announced an application had been submitted by a company called Reliance Investments Ltd for the refurbishment of Aldborough House, Dublin. The plans propose the building, which has lain empty and neglected for the best part of two decades, be converted to use as offices, with the addition of two substantial glazed wings and an underground car park. The unhappy condition of Aldborough House has been discussed here more than once (see A Thundering Disgrace, January 13th 2014 and A Thundering Disgrace No More, February 27th 2017), as well as the very real threats to its survival. Vernon Mount, Our Lady’s Hospital, Belcamp House: the recent decimation of Ireland’s architectural heritage is a dispiriting roll-call. So far Aldborough House has not gone the same way, but it remains at risk. No doubt Reliance Investments’ scheme will generate opposition since it affects the character of the building and its site. However, both of these have already been so severely compromised that no one can claim the original integrity of Aldborough House is recoverable. Furthermore, the history of the property over recent years indicates options for a viable future are few: hitherto nobody has come up with a feasible strategy. Much as it might be wished that either state or local government would wake up to their responsibilities and intervene, the likelihood of this seems remote. Wishful thinking is not going to yield results, nor is hostility to a commercial development. Accordingly what is proposed by Reliance Investments may be far from ideal, but unless someone comes up with a realistic alternative it could prove the best – if not the only – chance around to ensure Aldborough House remains standing. Meanwhile, today’s pictures are a reminder of the building’s present condition. The pointed gable entrance front of a former national school in Ballinlough, County Meath. Dating from around 1850, the neo-gothic building still retains many of its original features, not least the separate entrances for boys and girls. Unlike many such school houses which have been abandoned or demolished, it is now in use as a community centre. Immediately above the village of Ballyvourney, County Cork is a shrine to St Gobnait: a shrine and well here still attract many visitors. On a site immediately below the old church and graveyard – and adjacent to a holy well – stand the remains of a once-fine residence, its buttressed south-facing entrance porch incorporating a substantial gothic window. Samuel Lewis’s 1837 Topographical Dictionary of Ireland mentions that the Church of Ireland church above ‘is a very neat edifice, in the early English style, erected in 1824 by aid of a gift of £600 from the late Board of First Fruits. The glebe-house was built at the same time, partly by gift and partly by a loan from the same Board.’ This house was the latter building but sadly the roof has now collapsed and, their immediate surroundings currently occupied by a herd of calves, the walls look set to follow before too long. A fortnight ago the Roman Catholic Bishop of Kerry was widely reported as warning that a decline in numbers of clergy meant it would soon no longer be possible to provide services in all parishes. Here, as elsewhere in the country, there are now more churches than priests, with the consequence that many of the former will begin closing their doors. Some have long since done so, such as this building in Cahersiveen, County Kerry. Dating from the mid-18th century, it is a rare survival of a penal chapel, one of the backstreet centres of worship permitted to exist before legislation against Catholics was gradually abolished. When the naval surgeon Thomas Reid visited Cahersiveen in 1822 he reported that such was the throng attending mass here only about a third of the congregation could be accommodated inside the walls. Much of the credit for the abolition of the old Penal Laws belongs to Daniel O’Connell, who was baptised in this building in 1775 (his parents are buried in a graveyard immediately opposite). One might therefore imagine that given that pedigree the chapel would be cherished and well-maintained. Such is not the case: it appears that only thanks to the strenuous efforts of a local man, chemist Geoffrey O’Connor who died three years ago does the chapel still stand at all. Its present condition is a premonition of what could yet become of many Catholic churches both in Kerry and elsewhere across Ireland. One of Ireland’s lesser known mediaeval monuments: the 15th century Desmond Banqueting Hall in Newcastle West, County Limerick. Built on the remains of an earlier structure (the remains of lancet windows on the south wall suggest it may once have served as a chapel), the hall sits above a vaulted lower chamber. The building was part of a castle complex developed here by the FitzGerald family, Earls of Desmond who remained in occupation until the end of the 16th century. The castle then passed into the possession of the Courtenays, later Earls of Devon, but was badly damaged during the Confederate Wars of the 1640s and likely not occupied thereafter (an adjacent house, occupied by the Courtenays’ agent, was burnt in 1922 during the Civil War). The Banqueting Hall was restored some years ago when an oak screen and musicians’ gallery were installed, along with a hooded limestone chimneypiece.